Trusting the wrong company with your exhaust cleanings can land you in hot water with the fire code inspector or even lead to a fire at your restaurant. Put your worries to rest by partnering with Flue Steam for restaurant kitchen exhaust cleaning in Newport Beach CA. We employ highly skilled, certified technicians who will get the job done right to leave your exhaust hood and ducts visibly clean. Because different parts of the exhaust system accumulate grease at different rates, we offer two different types of restaurant kitchen exhaust cleaning in Newport Beach CA. Most kitchens will need their exhaust hoods scraped by hand every month and their entire duct system steam cleaned every 3 to 6 months. As a convenience for our clients, we always provide Certificate Performance stickers after every cleaning. Our clients find these stickers very useful for proving to code inspectors and their insurance providers that they are taking proper care of their kitchen exhaust system. Exhaust fan inspection: As a courtesy to our clients, we always inspect the exhaust fan when providing restaurant kitchen exhaust cleaning in Newport Beach CA. We grease the fan bearings and we can even replace the fan belt if you have spares on hand. 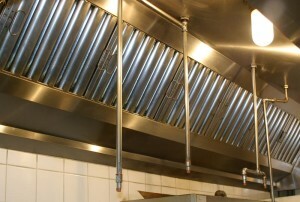 Can’t remember the last time you had restaurant kitchen exhaust cleaning in Newport Beach CA? It’s time to call Flue Steam. We can have a crew at your restaurant ASAP. Please call 800-700-FLUE now to schedule service.